Colgate Total&#39;s #30DaysOfLOL - It&#39;s A Wrap! 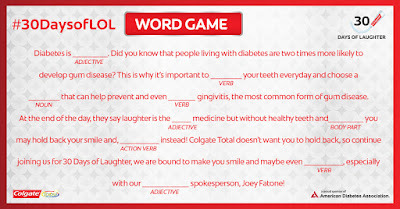 Hometype 2Colgate Total's #30DaysOfLOL - It's A Wrap! Colgate Total's #30DaysOfLOL - It's A Wrap! As ColgateTotal� and The American Diabetes Association�s #30daysofLOL comes to an end, I�ve had a lot of fun - and I�ve also been continually reminded of certain constants re: living the D life, and learned a few important lessons in the process. Humor: Coping with diabetes is a lot easier when you can laugh - Humor is what keeps me sane when diabetes is on the edge of driving me bonkers. Community: The DOC (Diabetes Online Community,) is who keeps me sane when diabetes is on the edge of driving me bonkers. Type 3�s matter: People who love someone with diabetes (Type 3s,) lighten our load and make us smile. Every Diabetes Voice Matters: Keep using yours! People with diabetes are at twice the risk for developing gum disease. B. My overall health, knowing I am at a higher risk for serious gum problems because of diabetes. 4. Also, I didn�t know that 2 minutes worth of brushing is about the length of a pop song (SEE VIDEO,) or that t3 Joey Fatone�s Dad has diabetes. Sidebar and FTR: Joey Fatone still has mad Robot, groovy dance moves. Again - SEE VIDEO. So to all those who participated, posted, liked, tweeted, retweeted and shared in the #30DaysofLOL fun - THANKS from the bottom of my busted pancreas! 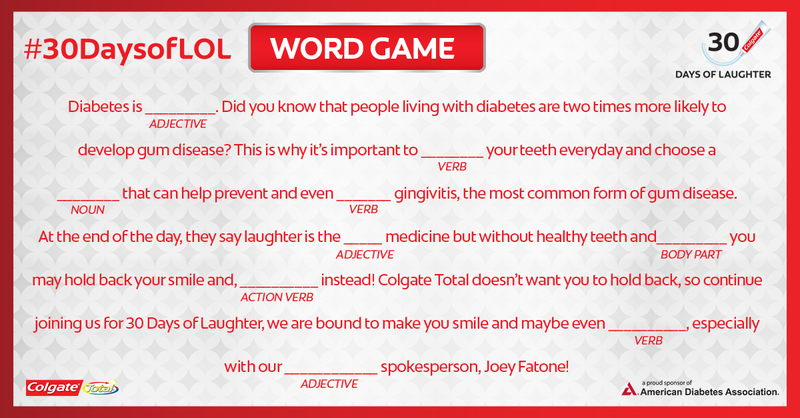 ColgateTotal� and The American Diabetes Association thanks you too!